Claudia Barnett’s daring, poetic and dryly funny play imagines the life of Aglaonike, the ancient Greek female astronomer. Championing science when her contemporaries swear by mysticism and magic, Aglaonike confronts hucksters, visits the underworld, and befriends a tiger. The sophisticated script by Claudia Barnett brings us along for the journey with such a neat ebb and flow that it’s easy to find yourself hanging onto her every word. This mesmerizing coming-of-age tale seamlessly wends its way into Greek mythology through the eyes of an insatiably intellectual young woman, Aglaonike. And her tiger. Potent, powerful, and provocative, a true woman’s tale for the ages, Barnett’s story possesses temporal ubiquity that transcends great distances, making it smart, relevant and poignant now more than ever to the modern-day woman as she continues to strive for equality in her quest for knowledge. Hailey Armstrong, Annie Davis, and Sabas Del Toro in the WKU production. Photo by E. Shura Pollatsek. Amanda Stine, Brenden Peifer, and Maya C. Boyd in the University of Pittsburgh production of Aglaonike's Tiger. Owl puppet by Michael McDevitt. Photo by Amanda Olmstead. Janie Tyler and Arielle Conrad in the WKU production. Photo by Rachel Turner. Meredith Sullivan and Krista Marie Ivan in the University of Pittsburgh production of Aglaonike's Tiger. Mask by Michael McDevitt. Photo by Amanda Olmstead. Maya C. Boyd and Brenden Peifer in the University of Pittsburgh production of Aglaonike's Tiger. Photo by Amanda Olmstead. Aglaonike's Tiger had its first staged reading at the Summer Reading Salon of March Forth Productions in New York on August 4, 2014. Aglaonike's Tiger had a staged reading at the Carver Theatre in Birmingham, Alabama, on April 25, 2015. Directed by Bree Windham. Aglaonike's Tiger had a workshop production at 5th Wall Productions in Charleston, South Carolina. July 15-17, 2016. Directed by Blair Cadden. Aglaonike's Tiger had a lab production at the University of Pittsburgh Stages, October 12-16, 2016. Directed by Shelby Brewster, with puppets and masks by Michael McDevitt. Aglaonike's Tiger premiered at Venus Theatre in Laurel, Maryland, September 7-October 1, 2017. Directed by Deborah Randall. Aglaonike's Tiger had a mainstage production at Western Kentucky University, February 21-26, 2019. Directed by Carol Herin Jordan. 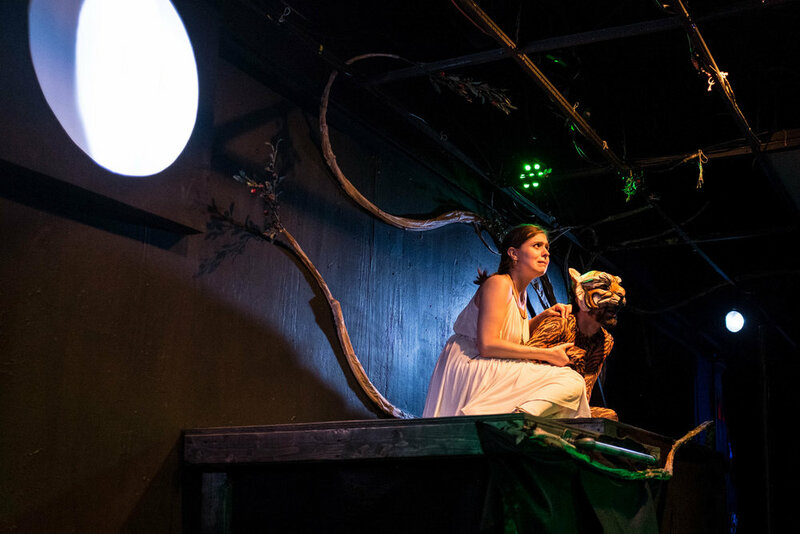 Ann Fraistat and Matthew Marcus in the Venus Theatre production of Aglaonike's Tiger. Photo by Mike Landsman.